"What great blessings there are for the people that are treated badly for doing good! The kingdom of heaven belongs to them. People will say bad things against you and hurt you. They will lie and say all kinds of evil things against you because you follow me. But when people do those things to you, know that God will bless you. Be happy and glad. You have a great reward waiting for you in heaven. People did those same bad things to the prophets that lived before you." You mean we are really blessed by being persecuted for doing what is good and by being insulted for being righteous? Now that's hard to take! Seeing ourselves blessed by God in such times is very tough. How can we be glad when we are persecuted, spoken about badly, and have evil lies told about us when we are trying to do good? But that is exactly what we see in the book of Acts. The early disciples considered it a privilege to suffer for the name of Jesus. In his first letter, Peter is constantly reminding believers to make sure that if they are going to suffer, they suffer because they have done what is right, not what is wrong. You see, the journey of discipleship is about developing the character of Christ and carrying on the great tradition of faithfulness demonstrated by the prophets. If they faced persecution for doing right, shouldn't we think we will? Even more, history has repeatedly reminded us that those who suffer to bring a blessing to others have a witness that cannot be silenced. That's why God is not ashamed to be called their God and why the Kingdom of Heaven belongs to them. More than just being happy, Jesus said these people will have a great reward! Holy God and Righteous Father, thank you for reminding me that the first goal in my life is not to be protected, but to be used to share your grace. 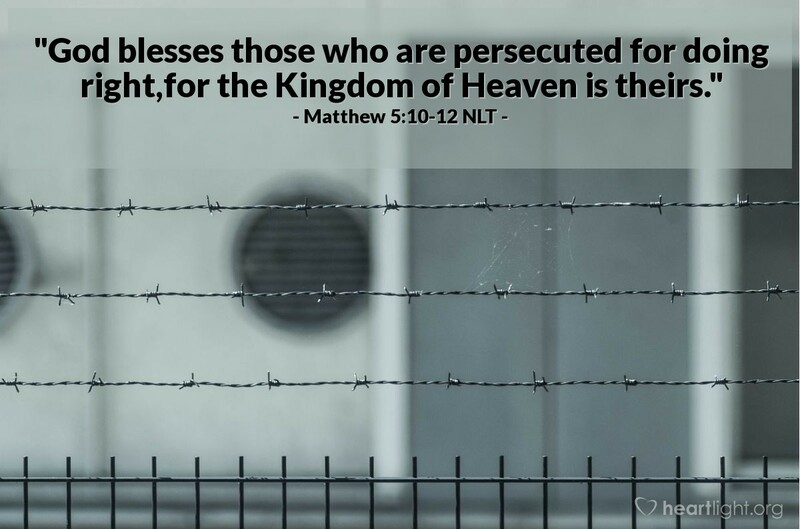 Help me to know that being persecuted for doing what is right is following in the steps of Jesus. Give me the courage and the passion to help lead others to the wonderful discovery of you, your grace, and your great reward. In Jesus' name I pray. Amen.